Channel your inner Italian and whip up a batch of your own fresh pasta. You’ll feel satisfied that you created something real and delicious and it’s much easier than you think. No, really…it is. Here’s one easy recipe that’ll have you throwing together fresh pasta dishes in no time. 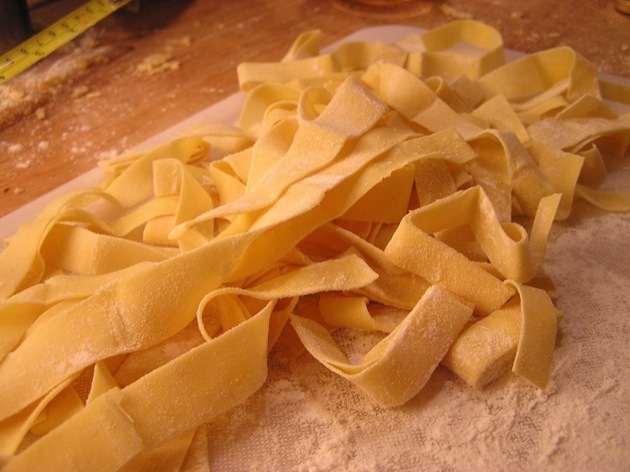 Making your own fresh pasta is fun, easy and impressive and can be used in a million different applications. When it’s done, it can be cut into any shape you want. Stuff little cutouts to make ravioli, cut large rectangles and make real lasagna, snip into strips and call it tagliatelle. No matter what you make of it, it’s delicious and worth the investment. This recipe makes about a half pound of pasta (2 servings). Using all-purpose flour will help cut down on your kneading time a bit. You can use completely all-purpose if you can’t find semolina. 1. Start by mixing and sifting your flours. Form a mound with a well in the center to hold your wet ingredients. 2. Crack the eggs into the center of your mound, break the yolk with your finger, and add the oil. Begin to incorporate the flour, starting with the inner rim of the well. As you expand the well, keep pushing the flour up from the base of the mound to retain the well shape. The dough will come together when half of the flour is incorporated. At this point, start kneading the dough with both hands, using the palms of your hands. 3. Once there is a good ball, remove the dough, scrape up and discard any leftover bits, and lightly re-flour the board. Continue kneading for about five or six more minutes. It should be elastic and a little sticky. 4. Wrap in plastic and allow to rest for about 30 minutes before you roll it out. 5. Roll out dough using a rolling pin or pasta maker and cut into desired shape. Blanch quickly (1 minute) in boiling water and enjoy! This entry was posted in In The Kitchen, Recipes and tagged catering, egg noodles, fresh pasta, homemade pasta, italian, italy, Mathayom Private Chefs, pasta, recipe, semolina, st. john, St. John Catering, Virgin Islands. Bookmark the permalink.